The 6th Annual Florida Craft Brew and Wing Fest, presented by Sunrise Rotary, again took place at the Royal Palm Pointe Park in Vero Beach, Saturday, February 18. As in years past, being a family-friendly event, this fest had something for everyone, from barbecue wing vendors to craft beer tents to two stages of continuous foot-stomping-sing-along live music. Check out this site's preview story from last week. 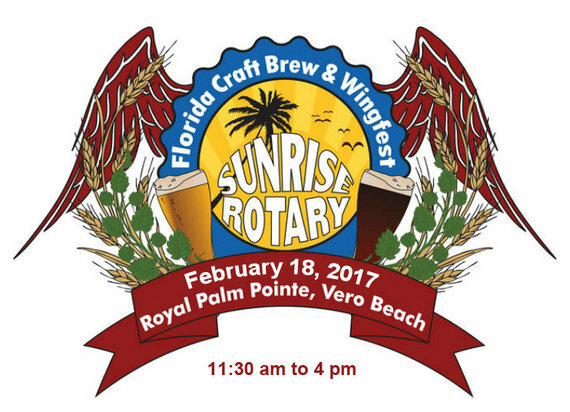 Back for its 6th year, the Florida Craft Brew and Wing Fest is again set to take over Royal Palm Pointe Park in Vero Beach on Saturday, February 18. Presented by Sunrise Rotary Club Vero Beach, the fest will feature 17 local wing vendors, over 200 craft beers, and two stages of live music all afternoon. Wanna bring the kids? No problem: it's also a family-friendly event, featuring a new root beer tasting contest for the kids this year. In addition to the many different types of wings, you'll also find pizza, burgers and snacks. Sodas are also available.